If you are a small business owner, you understand how difficult marketing can be especially when marketing your website. A large part of building a website revolves around search engine optimization. Let’s first dive into what SEO even is. Search engines and SEO will play an important role in the future of your business. Search engines like Google, Yahoo, and Bing are a key way in which we all now look for products and services. No SEO means no visitors from search engines. 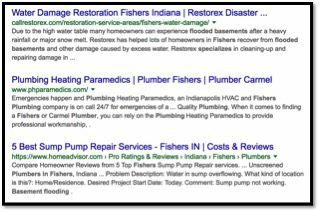 Many small businesses are realizing that not ranking on Google searches is killing their business. Why do you want to rank on Google searches? Think about it this way. When your basement starts flooding, what do you do? Back in the day you may have looked in the yellow pages, or called your plumber that’s been in the family for years. Today we just whip out our smartphones and Google “Plumber in Fishers specializing in basement flooding”. Many of us don’t make it to the third or fourth page. Why would we need to if we can find what we are looking for right away? It pays to be number 1! You can also pay to be number 1. 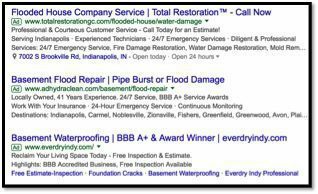 There are three primary sections in Google where your website could potentially rank: paid results, local results, and organic results. Let’s see how that would look on your search for a Plumber. Note the Ad symbol. These businesses are paying to rank. This section lists businesses in the visitor’s local area. King of the hill! You have to work to get here. What’s the secret recipe? Authority and good SEO. The local results are exactly what they sound they are—they are local. This section lists businesses in the visitor’s local area. 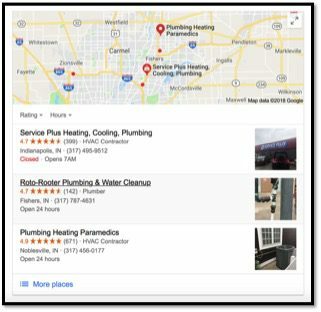 For example, if you search “plumber Fishers,” Google will show three Plumbers spots in Fishers and the surrounding areas of Indianapolis. However, if your location is turned on, Google will list Plumbers closest to your current location within Fishers. Organic results are a little different. This section includes a wider range of websites— not just local businesses. While the location may still be a factor in the organic results, it is not generally the dominant factor. The main factor is the authority of the website and good SEO which is why you will often see the top websites are larger, nationally recognized brands. That’s not to say small business don’t have shot to rank. Google rewards websites based on a number of criteria, and being relevant is one of them. This is why you will see the keywords you typed in appear in the Meta Description—a snippet that summarizes a page’s content. Search engines show the Meta description in search results mostly when the searched for phrase is contained in the description. This is a simple form of an SEO tactic. An experienced SEO consultant will help you identify the type of SEO that is important for your business. This will be influenced by the industry you’re in, the geography in which you operate, and your SEO strengths, weakness, opportunities, and threats. What Goes into a Comprehensive SEO Strategy? SEO is it building a perfectly optimized website. SEO is ensuring you present a highly positive and credible image to potential customers. SEO is content marketing via search engines. SEO is building links and authority. SEO is conversion rate optimization and analytics. SEO is usability and UX. Unless you are a small business owner by day and a digital marketing specialist by night than you probably don’t have time to do all the SEO for your business. Is SEO right or your business? The short answer is yes, but that doesn’t mean that every business needs a comprehensive SEO strategy. Things to consider when implementing SEO strategy! SEO can get expensive. You may not have the budget to compete with established competitors. An experienced SEO consultant will help you identify the type of SEO that is important for YOUR business. The results of SEO work done today might not become apparent, and might not be credited by search engines, for weeks, or even months. Some search terms are dominated by paid advertisements and established brands. It can be hard to compete. Find out what the sites ranking on the 1st page for the keywords that you want to rank for have done. Find Out Exactly What Your Customers Are Searching For! Want your website to be relevant to your customer’s searches? You might not have the time to do SEO yourself, but you also don’t have the budget to hire anyone else. If you don’t have the time or money you can, and should make sure the content you are writing is relevant. The first step is finding the most popular keywords people use when searching for your type of business, then apply those keywords to your website. 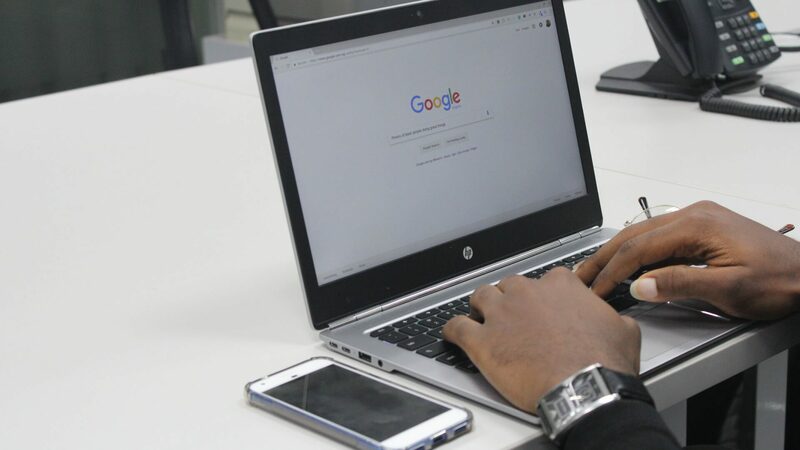 By signing up for a free Google Adwords Account you get access to Google’s keyword planner, which allows you to find the approximate number of searches that a particular keyword gets in a given month. This is a great tool for getting ideas, and writing relevant content. Need help growing your online presence? You know you need a strong Internet presence to grow and attract new customers, but if this is how you get it, it seems like all pain no gain! What if there was a partner who could develop and manage your Internet presence so you could focus on running your business? Charley Grey is a Fishers, Indiana web design agency. We build and manage high performing websites for businesses all over the nation. Lets Talk!